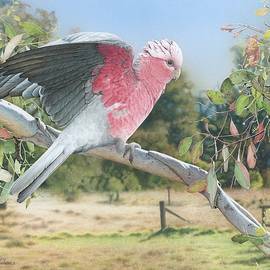 Born in January 1965, AUSTRALIAN artist Frances McMahon has had an avid passion in illustrating Australia's beautiful native birds since the age of five. Her talent was apparent at an early age, accepting her first commission when she was around fourteen, to renowned artist Paul Ashton Delprat, now principal of the Julian Ashton Art School. Paul swapped her painting for one of his etchings ~ a swap Frances was delighted with! Frances is entirely self-taught. Her original paintings now hang in private collections in New York, Minnesota, Ontario and her home country of Australia. 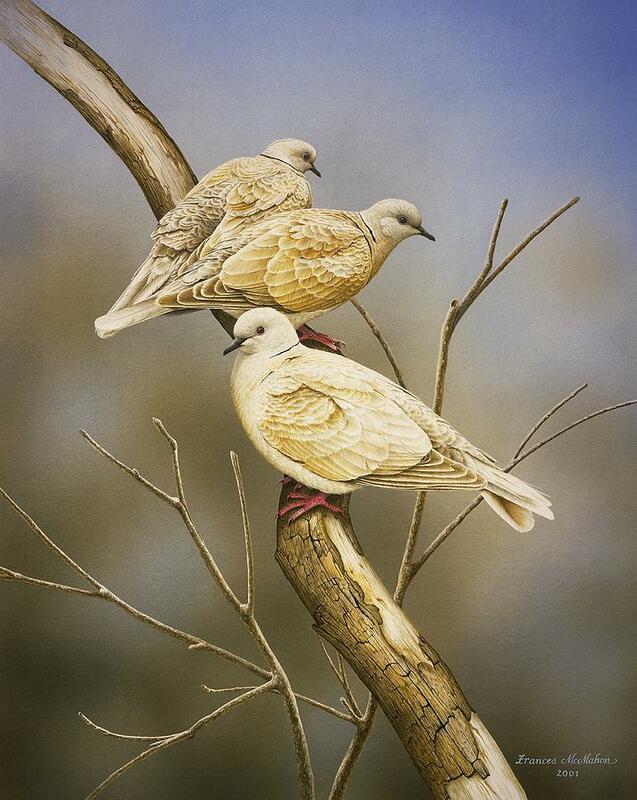 Developed over many years, her technique consists of airbrushed backgrounds (liquid acrylic), with the main work completed in watercolour and transparently applied gouache. Using a minute brush, each painting may take between 30 and 230 hours to complete. 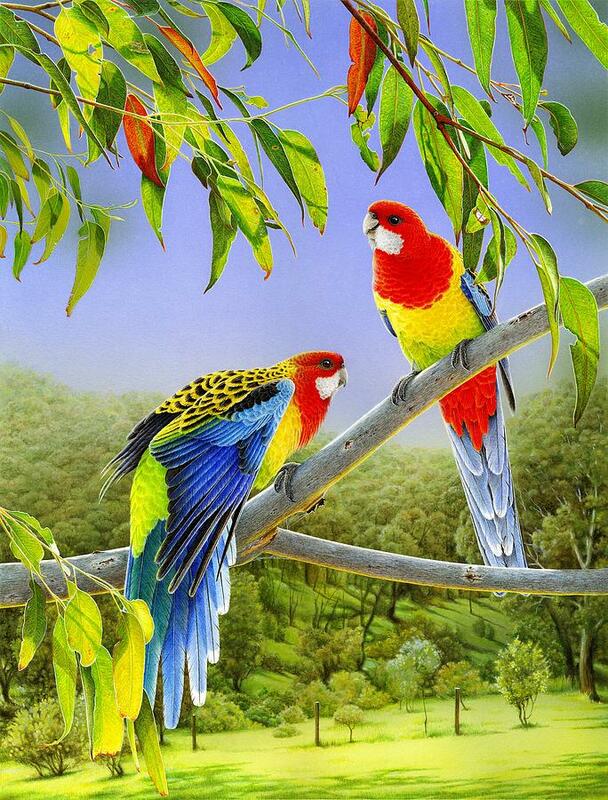 Some details are so fine they may only be seen with a magnifying glass. Ensuring the longevity of each original painting, only the finest quality archival materials are used. All paintings use either 1680gsm Canson Conservation Board OR 2000gsm Rising Museum Board for the ground. This is completely acid free, mildew and rot resistant, buffered against acid migration and free from optical brighteners. Additionally, only ASTM rated I or II paints are used, to ensure maximum lightfastness. All original works are framed to the highest conservation standard, using museum quality 100% cotton rag matting, and "tru vue" Conservation Clear glass, which cuts out 99% of damaging ultra-violet rays. Since 2016, Frances is now framing with Museum Glass. This is not only UV protective, but cuts out glare and provides the viewer with an unbelievably clear view of the artwork. The clarity has to be seen to be believed! 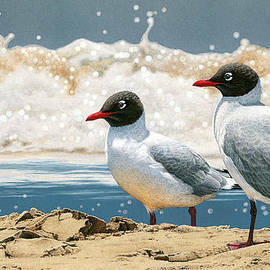 From January 2013, all original paintings will come with a Certificate of Authenticity, signed and dated by the artist. TIP: If you run your mouse over the image(s), bright green squares appear. LEFT CLICK on any square, and a full-resolution preview will appear. 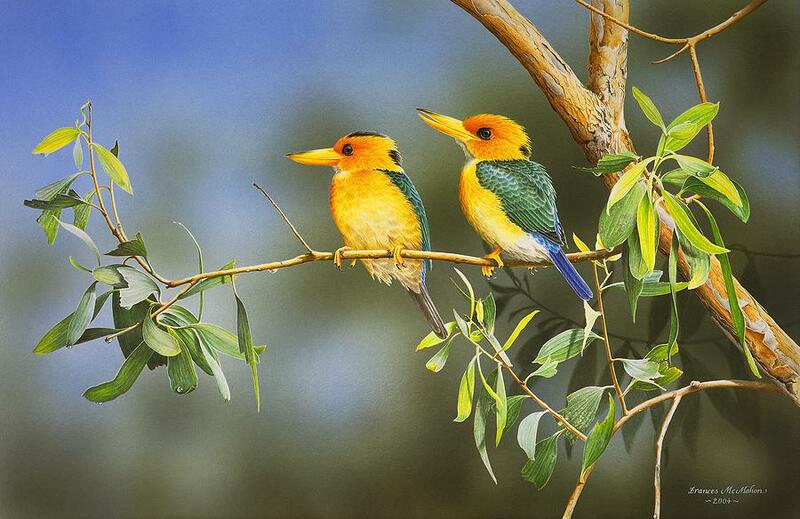 I recommend having a look at these, as these enlargements will give some idea of the detail involved. Diploma of Arts (Graphic Design) 1986. 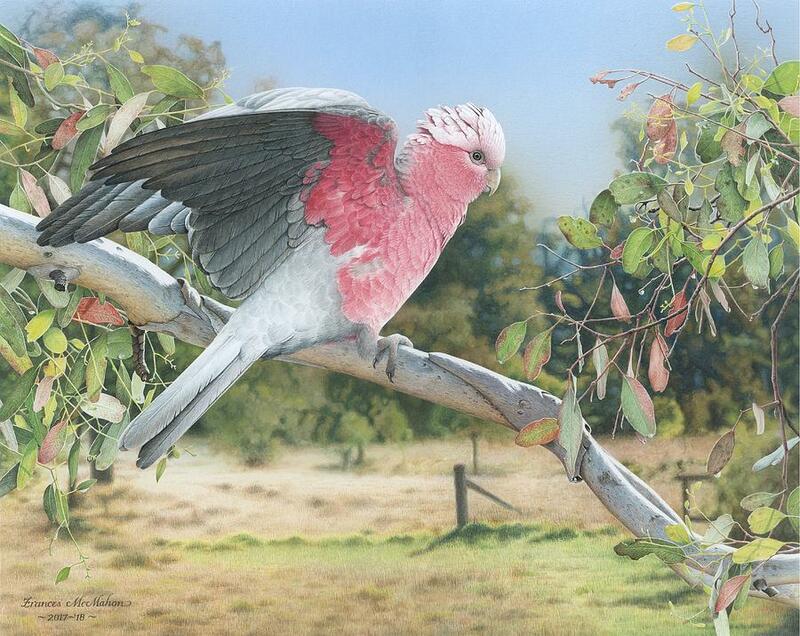 WINNER of the SAM SLATER ENCOURAGEMENT AWARD (for an artist under 25 years) at the prestige Australasian Wildlife Art Society's 1992 Annual Exhibition. 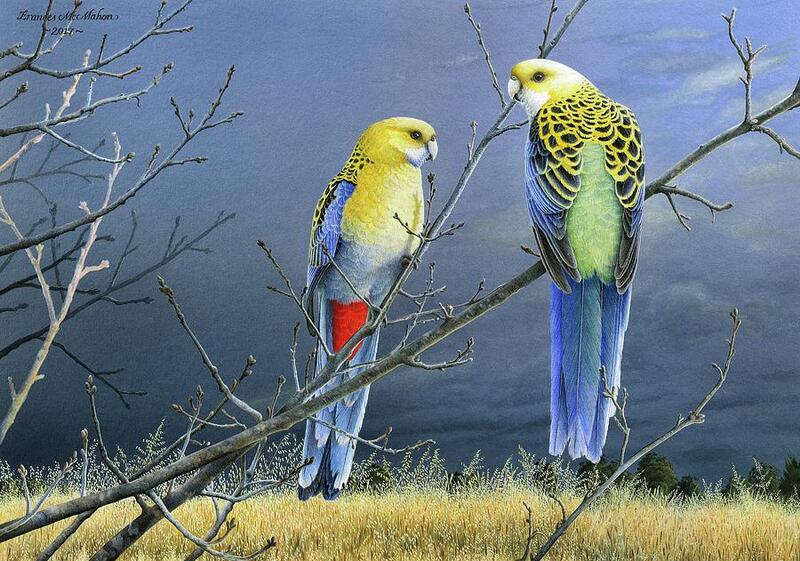 RELEASED FIRST OPEN EDITION PRINT (2000) : "Waiting for the Rains" (Eastern Rosellas). 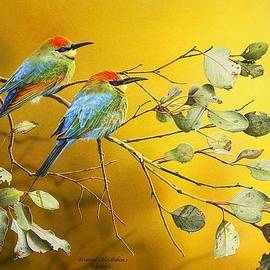 EXHIBITED at Morpeth Gallery's Annual Wildlife Art Exhibition : 1999, 2000, 2001, 2002, 2003, 2004, 2005. 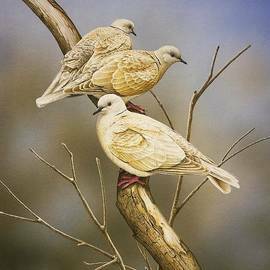 Voted 3rd most popular painting (People's Choice Award) Wildlife and Botanical Artists (ACT) 2nd Annual Art Show and Prize 2000. 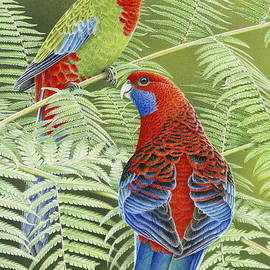 FEATURED ARTIST in the January 2001 and August 2007 issues of "Australian Artist" magazine. 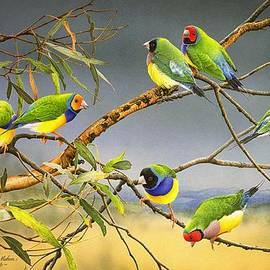 INVITED by Barren Grounds Bird Observatory to submit a painting which was silently auctioned in Sydney by Christie's in April 2001. This was part of a fund-raising venture. It sold above the reserve. 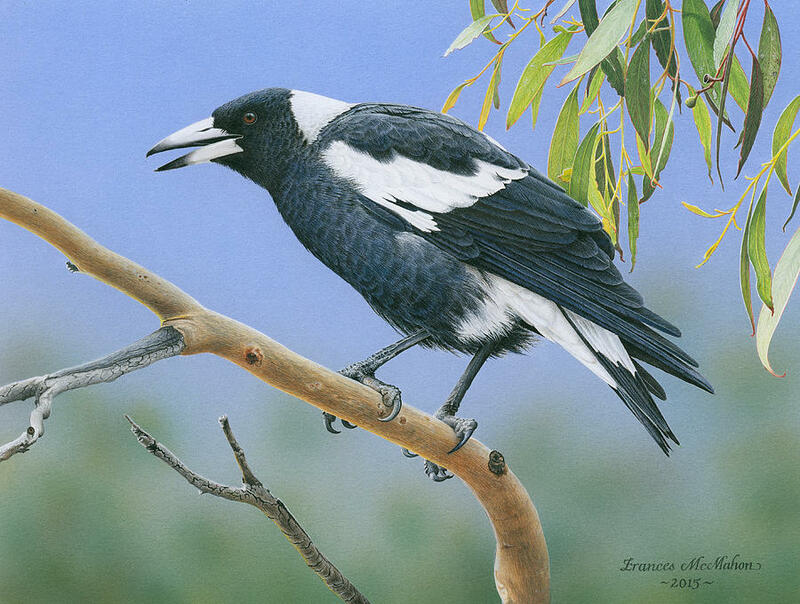 WINNER of the HIGHLY COMMENDED WILDLIFE ART AWARD ~ Wildlife and Botanical Artists (ACT) 3rd Annual Art Show and Prize 2001. 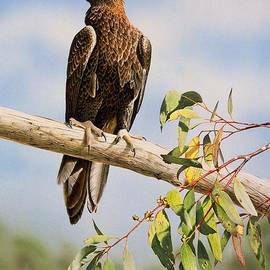 WINNER of the HIGHLY COMMENDED WILDLIFE ART AWARD ~ Wildlife and Botanical Artists (ACT) 4th Annual Art Show and Prize 2002. 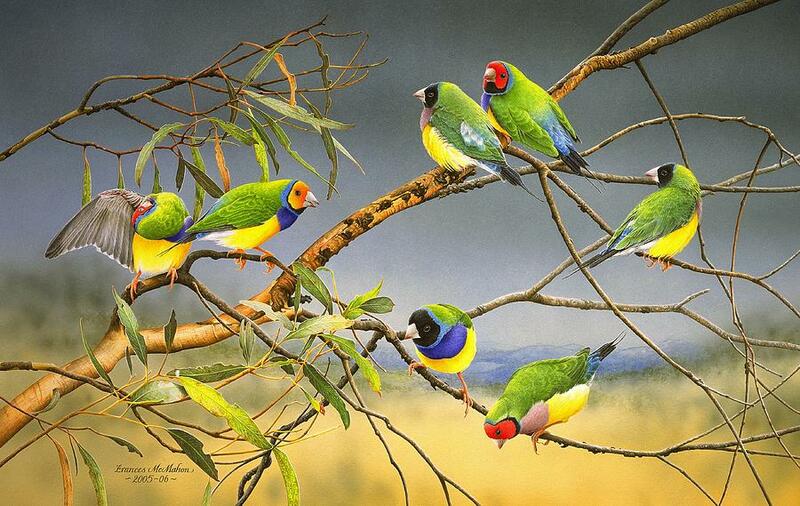 Five of her paintings were selected by Art Publishing for reproduction onto greeting cards. 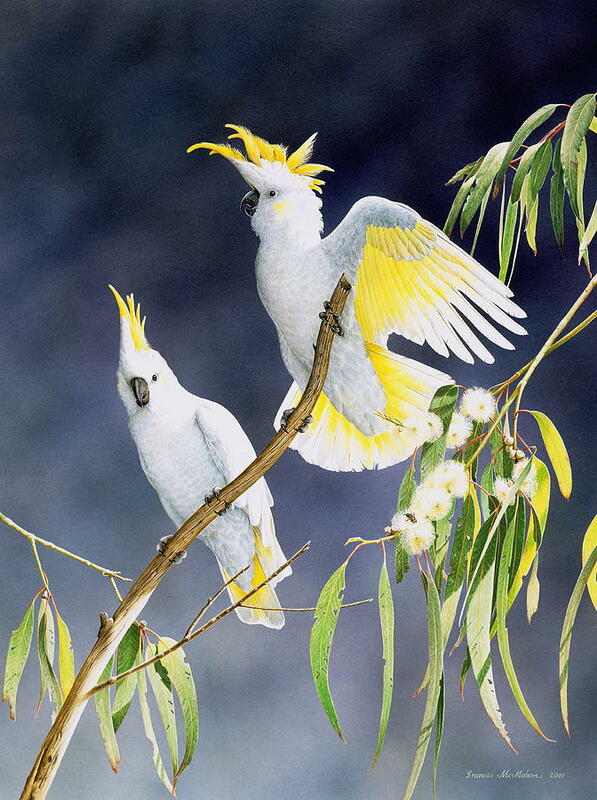 In November 2002, 1000 of each were printed and distributed around Australia and New Zealand. 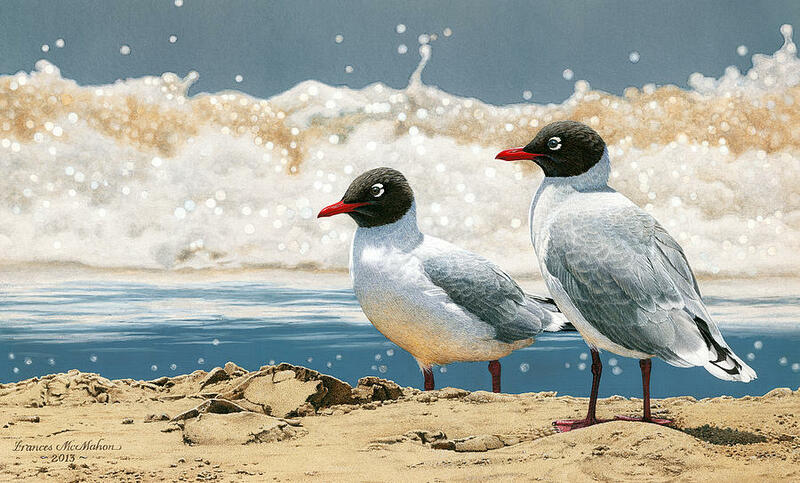 FINALIST in the International (inaugural) WATERHOUSE NATURAL HISTORY ART PRIZE 2003. 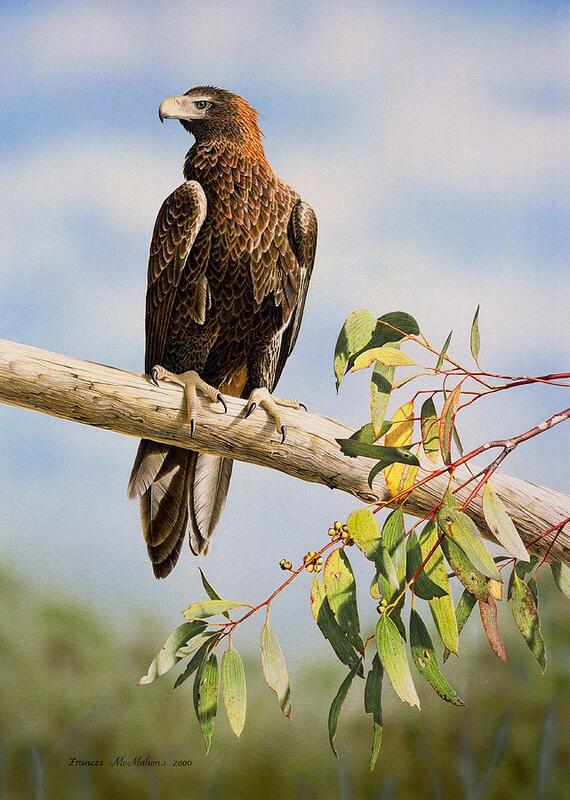 WINNER of the WILDLIFE ART AWARD ~ Wildlife and Botanical Artists (ACT) 6th Annual Art Show and Prize 2005. 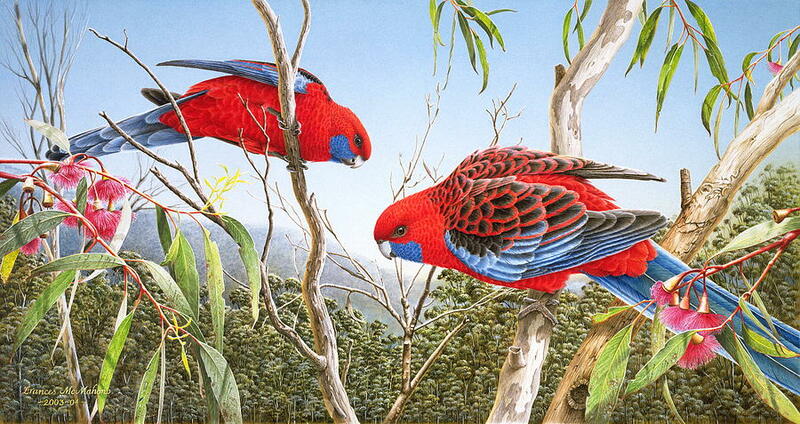 WINNER of the HIGHLY COMMENDED AWARD ~ Wildlife Art @ Discovery Exhibition, CSIRO, 2007. 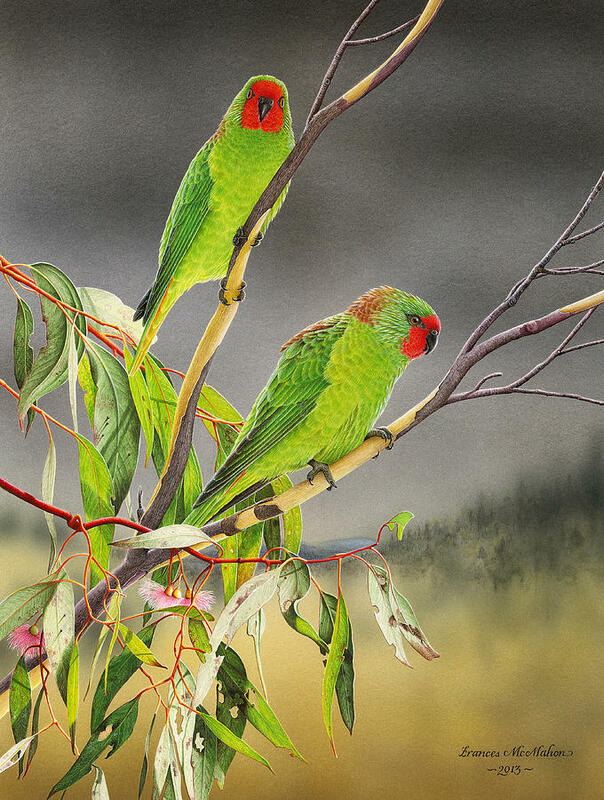 COMMISSIONED by the Friends of Australian National Botanic Gardens to illustrate every bird species commonly found there. A mammoth job taking two years to complete. 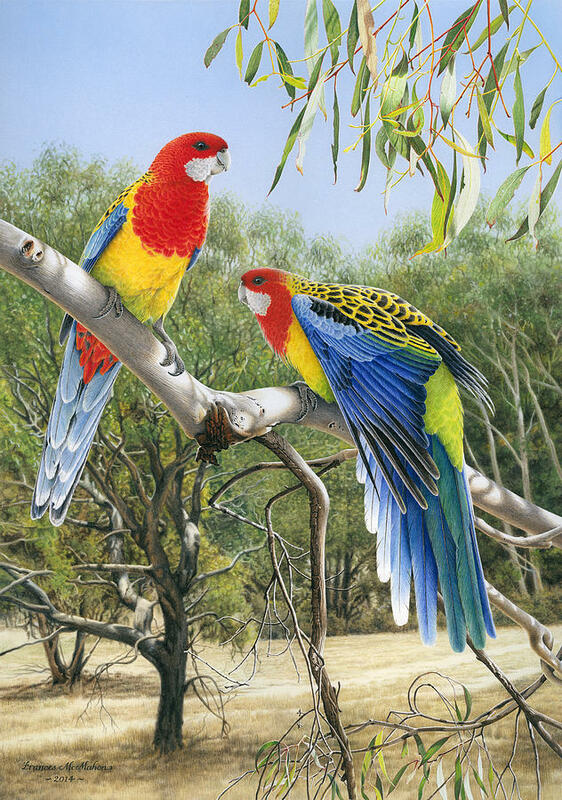 Brochures printed and now available from the Visitors' Centre, Canberra, Australia. 2011. 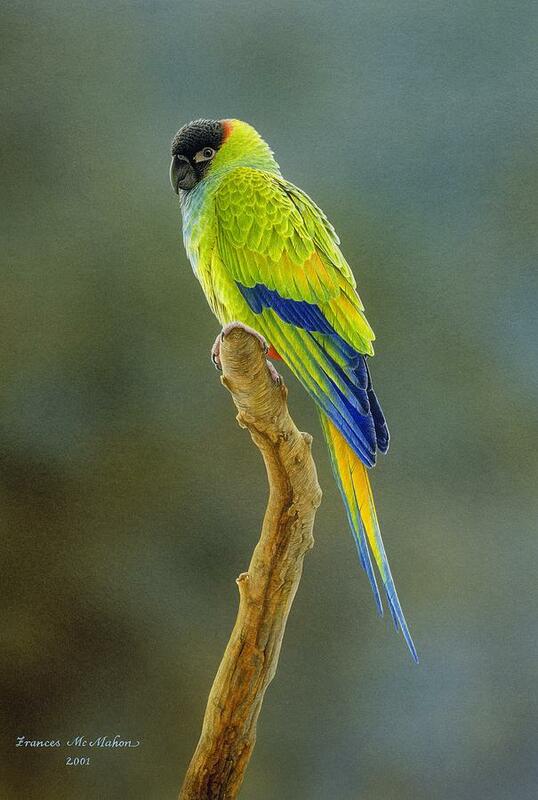 FEATURED ARTIST in the November 2013 issue of "Artist's Palette" magazine. This was a six page editorial, and her artwork made the front cover! 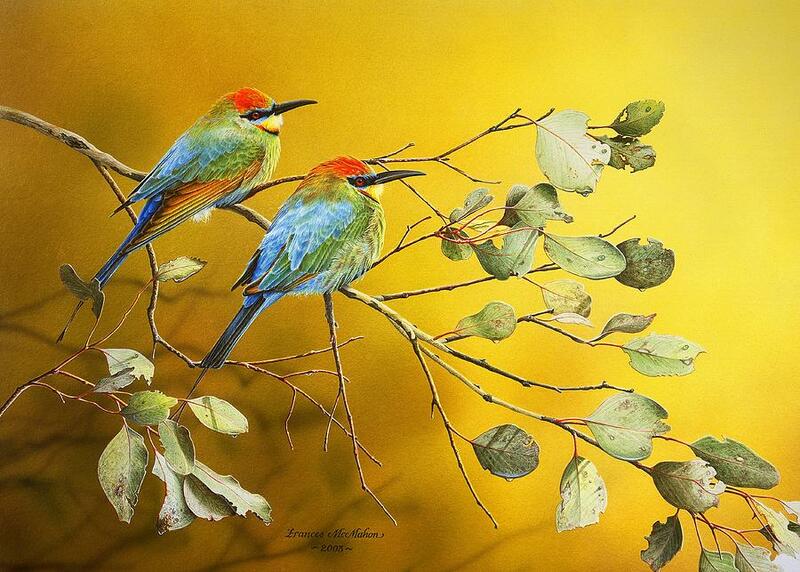 FEATURED ARTIST in the December 2014 Yearbook issue of "Artist's Palette" magazine. FEATURED ARTIST in the April 2015 (Issue 5) issue of "Creative Artist" magazine. This was a 10 page editorial, and her painting of a Black Duck made the front cover! CURRENTLY completing new original works, for private sale. 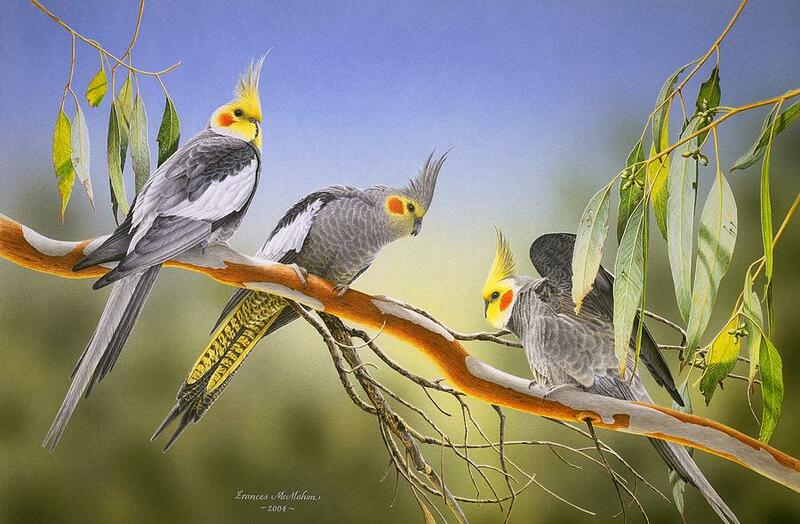 "Frances McMahon from Canberra uses brushes with just a few hairs in each. As a result her work is painstakingly slow but the detail is remarkable." "Every so often in our lives we are lucky enough to meet someone who is so immensely talented that when they do their thing it takes your breath away...her artwork is so stunning and lifelike that at a quick glance you may first assume it is a photograph." "Frances you are fantastic, (your work) reminds me of a friend of mine, Raymond Ching. Really well done...not many people out there with your ability. Congratulations." 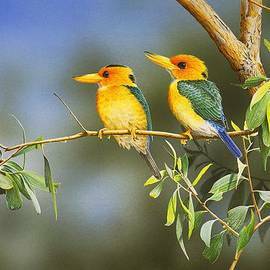 "I have had a look at your website and am quite impressed with your birds." Commissions are welcome. You may notice my prices have increased in recent years. Due to the extraordinary amount of hours each painting entails, I now charge a flat hourly rate, plus framing and freight (if applicable). Alternatively, if a client can only pay "x", I am more than happy to "size to fit" a painting to the client's budget. Each original work may take many hours to complete, but like most things in life, you get what you pay for! 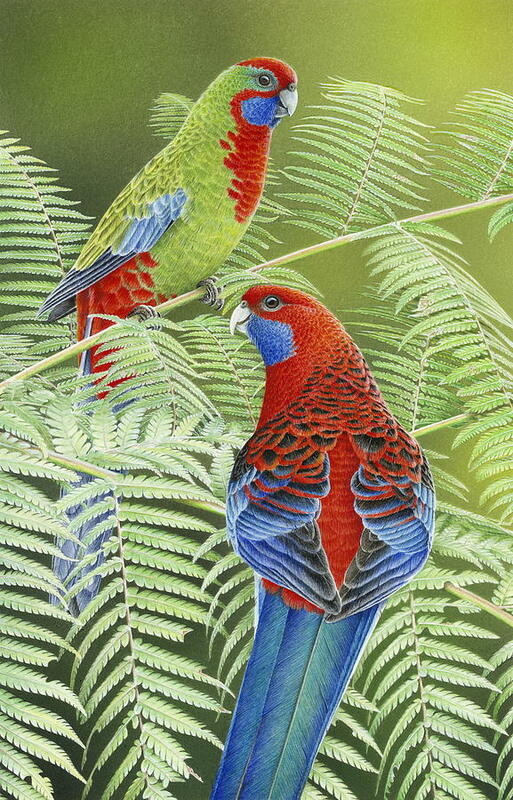 All paintings (except ANBG Brochure artworks) are now available as beautiful prints (either framed or rolled) and greeting cards through this website. Frances also enjoys many other interests and challenges in life. Between 2002 and 2015 she was a competitive adult figure skater, skating in competitions both locally and nationally. After retirement from skating, Frances returned to Classical Guitar studies in 2014 (after a 27 year hiatus), and in 2015 passed her 6th grade AMEB practical exam with Honours. In 2016 she passed her 7th grade AMEB practical exam with Honours,and is currently working on 8th grade for 2018. She has also passed her 1st, 2nd and 3rd grade theory exams will High Distinctions. In early 2017, she started teaching primary school age children guitar, a challenge like no other, but a thoroughly enjoyable one! 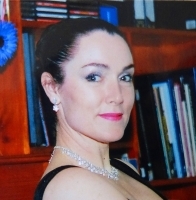 Frances is also a member of the Canberra Classical Guitar Ensemble.